Slice Of Slim: Hot Off The Press NEWS : Prize-winning Total Yoghurt Pots! Hot Off The Press NEWS : Prize-winning Total Yoghurt Pots! Earlier this year I was excited to find out that I had won a competition with FAGE Total Greek Yoghurt! FAGE UK sent me a delightful little box containing a chopping board, pestle and mortar and some ingredient ideas to help get my creative juices flowing! I had to create a Pinterest board and add my favourite recipe and ingredient ideas using Total yoghurt. Regular readers of Slice of Slim will know that I'm a huge fan of FAGE Total yoghurt-especially the 0% and 2% fat varieties. You'll see it appearing in many of my recipes; past, present and future. In my opinion, it's far superior to any low fat natural yoghurt out there as it's so thick and creamy and doesn't have the sour taste many other brands carry. It's high in protein and a hot favourite ingredient for those of us following SimpleStart or a Filling & Healthy day on the WeightWatchers plan. I add all sorts of ingredients to it in both sweet and savoury dishes and even use it in baked or cooked dishes. FAGE UK have also been wonderful supporters of my blog. They regularly send me batches of yoghurt for recipe development purely because they like my recipes-no strings attached. I will only ever use or endorse products on my blog that I would genuinely use in my kitchen, so you can rest assured I will never 'sell my soul' to promote a brand for the sake of a free sample! So...my fabulous prize was to have my Strawberry Cheesecake recipe, a short bio and link to my blog on thousands of the 500g pots of Total 0% fat Greek yoghurt pots sold all over the country. They have just been launched this week! I've found them on sale in Waitrose, Sainsburys and Tesco so far-very exciting to see them 'in the flesh' and a great honour too. For those of you wishing to keep my featured Strawberry Cheesecake recipe low fat, simply substitute the digestives for reduced fat or any of the WeightWatchers cookies. The pots are fab to keep after you've devoured the yoghurt as they have a tight-fitting lid-perfect for food storage or taking a salad/fruit salad to work or on a picnic for lunch. I'm also very proud to announce that FAGE UK have agreed to sponsor two of my future films for my YouTube channel. 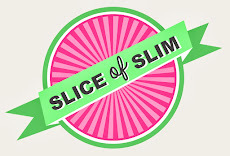 This will enable me to continue to bring you inspiring low fat tutorials fresh from the Slice of Slim kitchen to help support you on your weight loss/maintenance journeys. I will be looking for it Congrats this is what it's all about keep up the great job here! How fantastic!! Wishing you continued success, thank you for sharing your story Janey.